When grief, poverty, stress, or other hardships press down on us, the pain can overshadow our identity. The truth is, God has created each of us with a unique identity and purpose; something no season of hardship can delete. God spoke over Abram’s life and identity before his situation changed. He had a purpose for Abram’s life that infertility couldn’t overcome. It was a hardship, but it wasn’t his identity. Jesus spoke over Peter’s life and affirmed his purpose, even knowing Peter would deny him 3 times. Even a hardship of Peter’s own actions couldn’t change God’s purpose and plan. Q. Have you ever experienced a hardship that redefined your life? Do you think that situation shipwrecked God’s purpose for your life? Q. God saw leadership in Peter, even knowing he would falter. When you miss the mark, does it change your identity in Christ? Does it change God’s purpose for you? Q. Think of someone in your life who has been redefined by hardship. What would you say to them about their identity and purpose? Do you think God feels the same way about you? Take a few minutes as a family and thank God for giving you an identity and purpose. Ask Him to strengthen that sense of identity through seasons of hardship and to be a help to others walking through difficult seasons. This week we continue our series “Say What?” by talking about something very important, love. Love is easy when it comes to people we like; our friends, our family, BUT it can be quite difficult when it comes to our enemies. Jesus commanded us to love the people who hurt us. We need to pray for them, even when it isn’t easy! We must learn to love our enemies! But Saul, still breathing threats and murder against the disciples of the Lord, went to the high priest 2 and asked him for letters to the synagogues at Damascus, so that if he found any belonging to the Way, men or women, he might bring them bound to Jerusalem. 3 Now as he went on his way, he approached Damascus, and suddenly a light from heaven shone around him. 4 And falling to the ground, he heard a voice saying to him, “Saul, Saul, why are you persecuting me?” 5 And he said, “Who are you, Lord?” And he said, “I am Jesus, whom you are persecuting.6 But rise and enter the city, and you will be told what you are to do.” 7 The men who were traveling with him stood speechless, hearing the voice but seeing no one. 8 Saul rose from the ground, and although his eyes were opened, he saw nothing. So they led him by the hand and brought him into Damascus. 9 And for three days he was without sight, and neither ate nor drank. Q. Who was the man Jesus sent to Saul to lay hands on him? Do you think he was scared? Q. What if he hadn’t obeyed God and gone because he saw Saul as his “enemy”? Q. Do you believe God changed Saul’s heart? How does that change who he was and how other’s should see him? God changed Saul. He went from being an enemy to being a follower of Jesus! Paul was no longer anyone’s enemy because Jesus had changed him and his heart. Jesus changed us, He changed Paul, and God can change others too! Q. Do you feel like you have any enemies in your life? Spend time praying together as a family for the people in your lives who may be enemies. Pray God will help you love them with Christ’s love and show compassion to them! This entry was posted in Bible, Family Discipleship and tagged Christianity, church, Faith, Family, God, missionary, Missions, Prayer, religion, The Bible, Word of God, Worry. Missions: The vocation or calling of a religious organization, especially a Christian one, to go out into the world and spread its faith. That is why Speed the Light exists, to make it so that missionaries around the world can go further and communicate clearer to spread the Good News of the Gospel. Everyone is called to be a missionary. God has given us a big responsibility. Are you willing to answer the call? Q. God is asking you to go! In what relationships that you have in your life right now, is God asking you to be a missionary and tell them about Jesus? Q. Now that you aware that God has called us all to be missionaries to the people around us, how will you look at normal daily interactions with people differently? Take a few minutes as a family and thank God for calling you to be a missionary to those around you. Ask Him to help you see those moments that He has set up for you to share your faith. You have the answer that people are looking for. WORRY is something we all deal with! Kids have school, sports, tests, bullies, pressures, and friendships. All kinds of things can cause worry. It’s important to help our children realize that worrying and fretting doesn’t solve problems. It’s only by prayer and going to God that they can find the answers and help that they need! Have everyone sit together in a circle or small group. Tell your kids to close their eyes. Once they have done that, lead and instruct them in taking a few (maybe ten) deep breaths to help them relax. Then, let them open their eyes. Q. Did that help you relax? Q. Did you know we all have different types of stress in our lives which makes it hard for us to relax and not worry? Jesus told Martha she didn’t need to worry about anything but spending time with Him. Jesus can fix everything. He cares about every detail of our lives. When we are stressed and worried, we can spend time with Him and relax in HIS presence. Then, we can truly find the peace we are needing! Pray and spend time as a family relaxing in God’s presence. His presence is the only thing that can truly make our stress go away! It’s late Monday night and all is quiet at the Rhodes home. Everyone is in bed except me and it’s in these rare quiet times that I get to reflect back on the day. Let me give you some of the information that is constantly swirling through my head in regards to Abundant Life. We had 590 in church on Sunday including 100 children. We are set to have the largest “Speed The Light” missions giving year of any church in the history of the Illinois district. Our team going to Panama is shaping up to be the largest team I have ever taken. We continue to see new families every week and more and more of them are not Caucasian. We are tearing down racial barriers in the river bend! Over the past three years we have accomplished approximately $750,000 of renovations and improvements on the two campuses and we have done all of this with cash, remaining debt free. Last week we launched our small group/discipleship emphasis with about twenty different options for our congregation with groups available every day/night of the week in several different communities and a variety of times. We have two rows of youth sitting front and center on Sunday morning worshipping God! We have several of our staff and laity that are at various levels of completion of the Illinois School of Ministry with several taking their last courses and several who have completed all the educational requirements for ordination. My staff are intelligent, hard-working, loyal people of God! Our deacons are 100% behind my leadership. Among our core there is a growing hunger for God and we’re praying it spreads. We have great youth, children, and senior adult ministry. We had a great August financially and we are ahead for the year with the summer behind us. We have awesome worship, technology, and facilities. I am working toward one of my long held goals of earning my doctorate. Literally this list could go on and on. Then why am I sitting here tonight feeling down and as if I can’t make any progress? Why is my heart heavy and my Spirit downcast? Simply put, because I got a single piece of news this week that was not in this same positive direction. The news didn’t include any conflict, no one was angry, there was no staff problem or anything like that, it was just one piece in a very big puzzle. Why then with all of these great pieces of information can I not take my eyes off the single negative piece? I think there is something wrong with me. In fact, I think there is something wrong with all of us. In the midst of the favor and blessing of God we can forget all that He has and is doing for us. Our fallen nature has an amazing ability to completely captivate our thoughts. We literally stop seeing the forest for a single tree! What can we do about this when it happens? I think a man named Johnson Oatman Jr. had it right when he penned these words in 1897. Psalm 103:1–5 (ESV) Bless the Lord, O my soul, and all that is within me, bless his holy name! 2 Bless the Lord, O my soul, and forget not all his benefits, 3 who forgives all your iniquity, who heals all your diseases, 4 who redeems your life from the pit, who crowns you with steadfast love and mercy, 5 who satisfies you with good so that your youth is renewed like the eagle’s. Already just having written these out I feel better! Let me encourage you to do the same. When life begins to get you down, remember all that God has done for you. 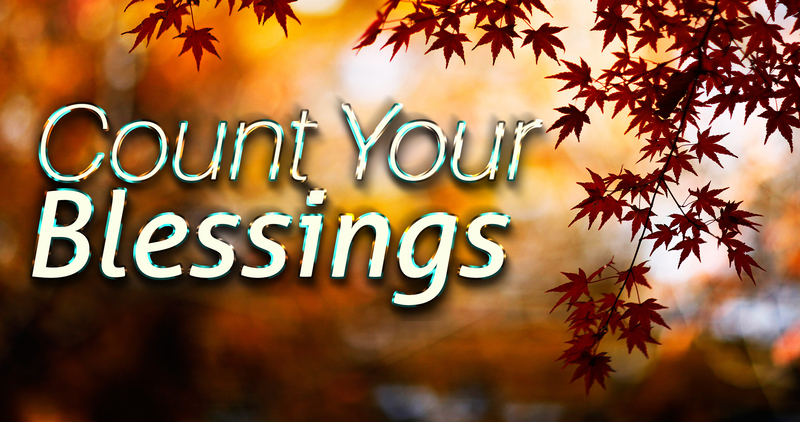 Rehearse in your mind the blessings that He has poured into your life. You’ll find friends, family, and opportunities. I bet you’ll find a very long list. After thinking about these take a moment and reflect on your greatest gift, your salvation. I suggest that in no time, like me, you’ll feel better! Well that’s enough for tonight. It’s almost midnight and there’s more to do tomorrow! This entry was posted in Uncategorized and tagged Blessings, fear, Worry.